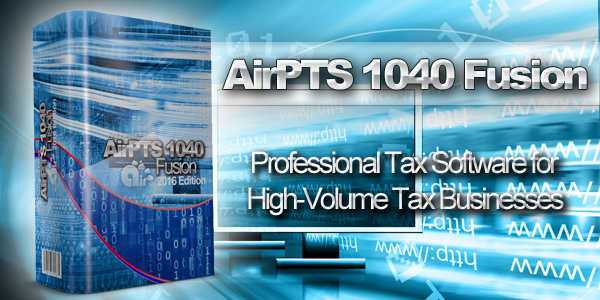 AirPTS 1040 Fusion is backed by the industry's leading Fusion professional tax software solution for high-volume tax businesses. Built based on the needs of busy tax offices that specialize in providing their taxpayer clients with fast and accurate tax returns, AirPTS 1040 Fusion has been a trusted software solution since 2016. With industry-leading tools such as Point-and-Shoot Error Correction™, exclusive TextLink™ integrated text messaging technology, and support for electronic signature pads and hand-held W-2 barcode scanners, AirPTS 1040 Fusion software users are able to process tax returns more quickly and accurately. Complete access manager to quickly and easily locate all information pertaining to your client's return, saving you valuable time. Ability to add additional users to your tax office with tools to help customize and optimize your business. Each preparer has a unique account name and password. Set privileges specific to each preparer such as e-file, bank, check printing, and reports. Disable account access at anytime. Run your office more effectively by generating valuable reports throughout the tax season. With over 50 standard reports to choose from, you can customize them specifically to meet your needs! The client organizer will help better serve your clients by providing them a simple question/answer worksheet that will prepare them for their scheduled appointment. Prior year tax information is pulled forward for existing clients. Print professional mailing labels for your client letters and marketing material. Choose from many standard client status options to generate labels fast and efficiently. Choose from several pre-written letters or compose your own client letters. Upload the company logo to give your office a professional, polished look. We understand how valuable your time is. These time saving auto-fill features will increase speed and accuracy to help run your tax office more efficiently! EIN database stores employer identification numbers automatically upon entry. Ability to customize your database anytime with an automatic add/delete option. Zip code database allows quick entry of address information by auto-filling the city and state based on the zip code entered. Seamlessly pull forward all existing client information from the prior year. Choose between a standard or comprehensive rollover. Depreciation is carried forward from year to year. Save significant data entry time. Manage and plan your time and your staff's time months in advance! Manage days off and vacation time months in advance. Schedule appointments for new and existing clients. Create custom reports for specific days, months, years, etc.